Evidence Based Practice is the evidence-seeking, results-based testing of assumptions and revising of practices that’s been revolutionizing the fields of medicine, nursing and psychiatry, and is making its way into EDUCATION and information technology. Evidence Based Practice identifies problems, asks if your practices are achieving the desired results, —and requires evidence to back up your actions/conclusions. It’s a decision-making rule that organizations can use to help them identify problems and avoid wrong or ineffective answers. It seeks solutions based on best-experience rather than guessing, …based on facts rather than fantasy and “the way we’ve always done it“. I first became aware of E.B.P. through my wife who is a Neo-Natal Intensive Care Nurse. In her field, like many others, there is a natural competition between the entrenched old guard and new approaches. There is “the way she’s always done it”, the “way they do it in another hospital”, the way certain schools teach it, the way the doctors want it, and the way the hospital admins and insurance companies want it. E.B.P. levels the playing field, and reduces the politics. In her line of work, E.B.P. has become the WATCHWORD that can literally save lives. Needless to say, the Church could used some E.B.P. Noah's sons covering their father's shame, rather than dealing with problem. “Because we’ve always done it that way”. “Because it works for us”. “Because that’s all the people will support”. “Because it’s within our budget”. “Because that’s what the pastor wants”. 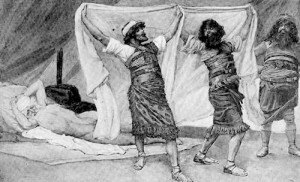 In many ways, congregations are like Noah’s sons, walking into the tent backwards to cover up their father’s drunken shame with a blanket, when we should be coming up with evidence-based solutions to solve the problem. The pastor takes an hour each Monday to “fix up” the previous Sunday’s sermon so that it can be posted on-line because the leaders think it’s a good idea and helps attract visitors. Whereas, evidence suggests that only few church members ever read the sermons online (including the leaders), and even fewer read them all the way through, and visitors obviously only need just a few REPRESENTATIVE sermons (or preferably a video), to see what your church may be like to attend. And yet the church wastes an hour a week of the pastor’s time (and web person’s time). How many more time-wasting-practices-based-on-flawed-thinking are eating up paid staff? Example: Small churches that hire youth pastors who don’t do children’s ministry, and have youth groups that aren’t growing or bringing in families. And yet many of those same churches have a stated goal (and need) for membership growth. Evidence strongly suggests that young families are a prime source of new members, are attracted by similar-aged people, and need places to get involved. E.B.P. would say, “change the professional and volunteer staffing pattern to match the evidence and desired outcomes”. Or think of the church which needs to grow, but has a pastor who doesn’t do visitation, and doesn’t make outreach events their own personal priority. EBP would look at outreach stats/research (that do exist!) and use them to direct the pastor’s job description, and evaluate their progress towards stated goals, rather than letting the pastor pick and choose based on their own preferences, and avoid evaluation. 3. A church wants to grow their children’s Sunday School attendance. Evidence suggests that increasing bonds/fellowship between parents, having an active family ministry for example, having (truly) high priority Adult Ed offering to attract parents (because children can’t drive themselves), and having the pastors actively engaged in the church’s teaching ministry (rather than “dropping in”) -would be CRUCIAL practices. I offer these as examples. You can debate the details. E.B.P. involves debate! What it does not involve, however, is wishful thinking, and ignorance of the large body of experience out there, especially that coming from growing congregations. My work developing the Workshop Rotation Model for Sunday School was Evidence-Based, though at the time we didn’t call it that. We began by admitting the evidence about our kids’ boredome, our teachers’ apathy and lack of creativity, and our curriculum’s lame-ness. We set goals to solve these problems, then created a Model designed to attack those problems, and experienced quantifiable evidence of our success. It required confession! …and a lot of out-of-the-box thinking, …not to mention heavy lifting, and encountering a few nay-sayers. 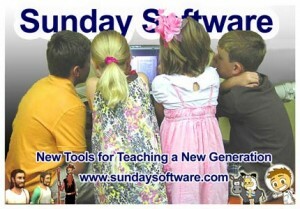 Same think with my work with software in Sunday School. I didn’t like computers when the idea of teaching with them was first presented! But I couldn’t deny the EVIDENCE that the kids went crazy for them, –and that their attendance, and their content retention, and their discipline improved. Why haven’t we done more E.B.P. in the church? Leaders are reticent to hold volunteers and staff accountable for results. Leaders are reticent to reconfigure staff positions and job descriptions. We have low standards for success, or maybe even a problem DEFINING SUCCESS. Leaders often don’t have the tools, -or the ideas, -or the time to make needed changes. The church’s “caring” capacity is usually much greater than their “CARRYING CAPACITY” …meaning we don’t focus on key activities, don’t know when to stop and change, and end up not doing some key things well. E.B.P. means regular evaluation of current practices, and new practices. The evidence might include soliciting anonymous feedback. For example, we could “follow up on visitors to find out why they didn’t come back” (evidence). One of the things that impresses me about E.B.P. in my wife’s work is that it is an ongoing process, -it is a culture of goal-setting and evaluation, not a temporary practice. And it gets applied to EVERYTHING in the venue, -from medical techniques, to staffing, to uniforms. By making it part of the culture of decision making, it cannot be “waited out” by naysayers, and the forces of inertia and tradition. Denial is a powerful force. E.B.P. is a confessional tool that helps get us past denial and can GUIDE change. Having tried “change” before, congregations can become resigned and fatalistic. They can come to believe they are doing the right things even as things get worse, or at best, plod along until a crisis reveals sand under the church -rather than rock. In many congregations, because they have looked the other way for so long, they have moved from the issue of “vitality” to the scary possibility of “mortality”. Congregations, like people, are good at covering up too. I was part of one church where the warning signs of the pastor’s increasingly poor leadership were covered up, and those (of us) who quietly questioned were ignored. Evidence Based Practice is not a “program of renewal de jour”. Rather it shines a light on everything we do, from big to small. HAVE MEASURABLE GOALS for everything you do in the church, rather than just a mission statement. Examine and JUSTIFY EVERYTHING as it relates to the church’s priorities: from copier use to staff, from signage to bathrooms, from smells to visitation, from the coffee budget to the outreach budget. Evaluate efficacy in light of your goals, and introduce what the outside evidence might suggest. In that spirit, I offer the following “low hanging fruit” …things that could be done rather easily and quickly. 2. Survey all existing church ministries and ask each to justify how it is addressing the church’s current priorities (if you don’t have current priorities, such as growth, then create them!). 3. Prioritize and Clean up your calendar. Committees and Church Councils should question existing and proposed events/groups, -asking how they serve the goals of the church, and don’t compete with other events/groups for time, space, leaders, attendees, and attention. 4. Look for inefficiencies in how you do things. Less is usually More when it comes to event planning and preparation, and in things like document creation/distribution, and meeting schedules. 5. Make Continuing Education part of your church leadership culture. Investigate and discuss books, articles, and statistics. Schedule annual leader retreats. 6. Institute Change as Your New Tradition. For example, commit yourself to revising and refreshing your Holy Week services at three year intervals. Hope this post helps get the conversation started in your church. This entry was posted in Advice & Ideas for Pastors, Staff and Leaders, Ideas for Changing the Church. Bookmark the permalink.